This is your San Diego Yacht Rental At Fantasea Yacht Charters we offer affordable boat cruises for up to 40 passengers. Fantasea is a custom-built tri-level San Diego Party Yacht. Period. For most that’s all they need to hear. You and your guests will love the time they spend on our 65-foot Pleasure Yacht. She departs out of San Diego at Harbor Island. 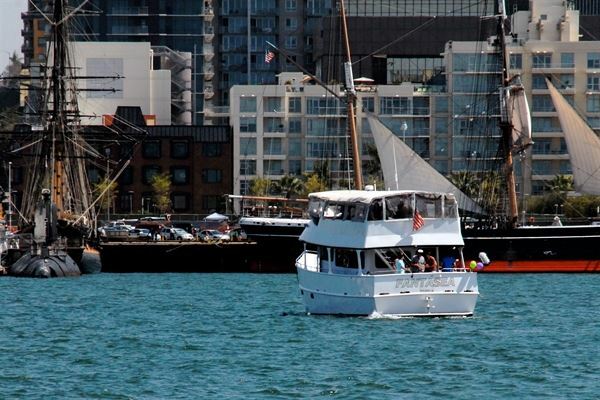 Complete Flexibility for You Fantasea accommodates your guests comfortably on scenic daytime or evening cruises throughout San Diego Bay. It’s your chance to experience the beauty of San Diego from the water and to entertain special guests in style and comfort for any type of party. Compare to other San Diego yacht rentals, and you wont find a better package to get your party started. Your Requests … Answered. Would you like to have a Bartender , DJ Catering Service? Let us get prices for you or bring your own! Lots of Interior Room The large interior is perfect for entertaining parties. The large upper deck is great for formal dinners or sumptuous buffets. Check out the exterior of Fantasea – she has the largest upper deck of any yacht its size. From the awesome view of the skyline from the bow, to the spacious upper deck, you’ll enjoy a complete yachting experience. Fantasea gives you More Unlike other Yacht Charters, you have a choice! You can Arrange your own entertainment or catering – or let us make the arrangements for you. The most important factor is your satisfaction, and you are only limited by your imagination. Learn about the Fantasea Standard. Great for Parties Our crew knows how to make your event a smooth ride…That means you can enjoy the best dancing on the bay for your gala – event – parties. We offer one of the only true 40 guest yachts in San Diego. Many guests have even brought live entertainment aboard! It also features a sound system for ipod or CD plugin. Great for Smaller Yacht Weddings Because of our Experienced and Professional Crew, you’ll receive a well directed cruise. This is especially important when you choose Fantasea for your Wedding. Whether you choose a band or DJ, a formal dinner or buffet, your special day is sure to be unforgettable. A cruise on the San Diego Bay is the most romantic way to begin your lives together. You are about to embark on one of your most favorite memories. We know you’ll receive better personalized service than you will receive from a corporately ran cruise. If you have, need, or want special requirements, we encourage it! We have set up a few pretty commonplace surprise parties events before. (Well even provide you the perfect plot). Cruises start at $400 per hour Two hour minimum.